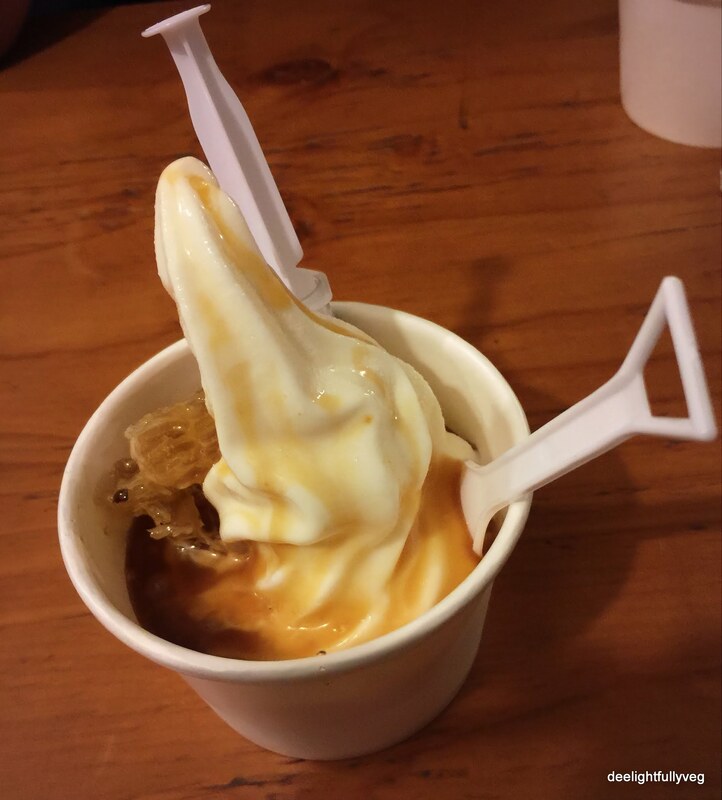 Korean style soft serve and yogurt joints have sprung up all over Singapore. After dining at Bali Lane, we were in search of a dessert place in the area. I spotted a dimly-lit place tucked away on the street and I decided to check their offerings. 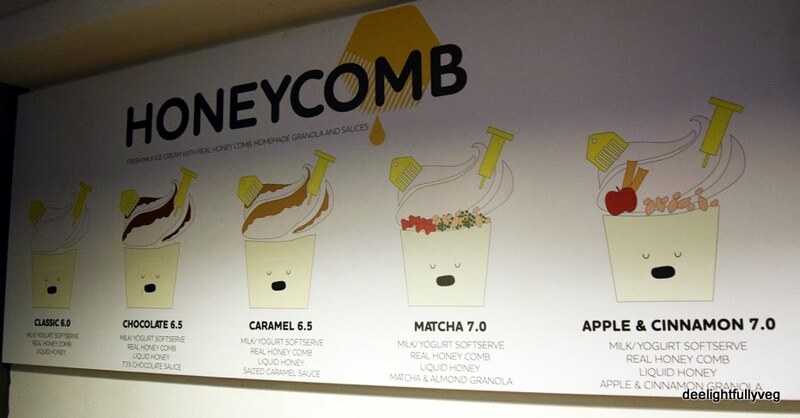 The place was called Honeycomb. The menu was displayed on a wall next to the counter. This is a very small place with no more than 20 seats. Since the menu is very simple, all you have to do is choose your base and toppings and place your order. I chose a yogurt base. For the toppings we chose ‘Classic’ and ‘Apple and Cinnamon’. As we placed our orders on the table, I noticed something very intriguing. 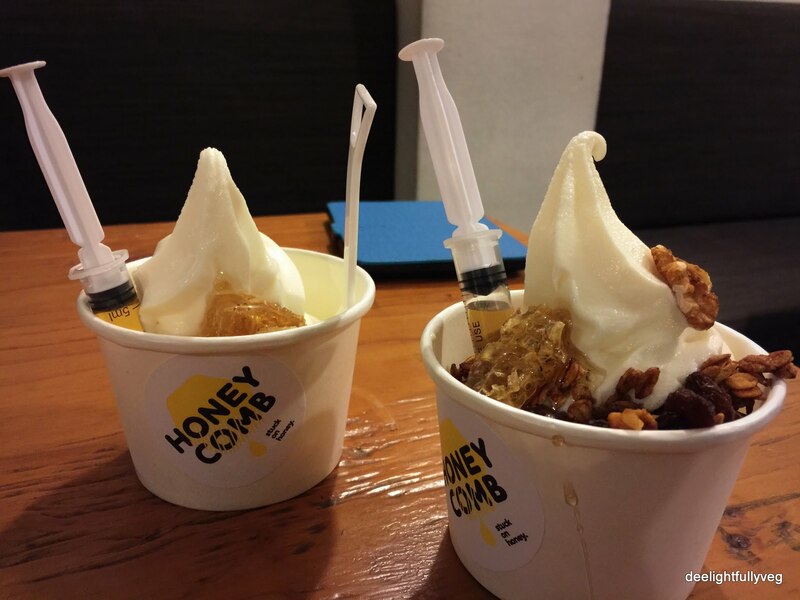 On top of the yogurt, there was 5 ml syringe which contained honey! There was also an actual honeycomb piece in the serving. The yogurt serve was topped off with apple and cinnamon granola. This made every bite nicely crunchy and it will remind you of the cereal that you have for breakfast, only much sweeter. It was nice to inject the soft serve with honey as and when required. The real honeycomb is chewy and is authentic in taste. We also tried the ‘Caramel’ flavour on a milk base. It was too milky for my liking. I definitely preferred the yogurt base as compared to the milk base. The salted caramel sauce was average. It was also very sweet with the milk base. One the whole, I wish there was better lighting and a happier atmosphere to the place. It looked gloomy and the staff did not seem very interested. But if you are in the area and want a different ice cream experience, this place is worth a try.